Thanks for making the neighborhood prettier. Who make this???? It's very beautiful! It is nice to have crafty people around. They make the world a prettier place. If only the entire world thought like this. I want to hug them. 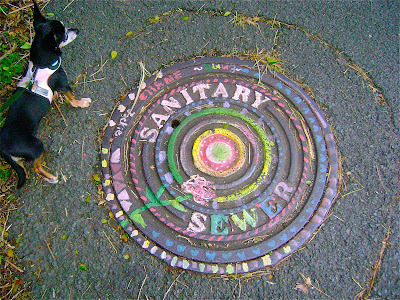 That's the prettiest sewer cover I've ever seen :) They need to come to my neighborhood. What a great collar! By the way is Jorge walking you, or are you walking Jorge? Awwe how cute! Did some neighborhood kids (girls) do it? Oh - a RANDOM ACT OF BEAUTY! I LOVE it!!! We once had to pour a section of sidewalk in front of our house. I wanted to sprinkle glitter into that section. Hubby said it would look silly. I still regret skipping the glitter! Awww, that's so delightfully cheerful and fun. Makes me want to go outside and color with chalk. Except it's freezing out there right now... Nice job, artists! I'm going to make a wild guess and say that "Emma, Ellane, and Jackie" make this. Am I right? Hm?